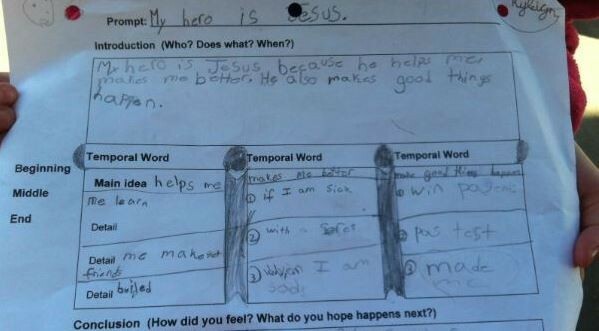 Student Asked to Change Paper on Jesus-Truth! - Truth or Fiction? This eRumor contains true information about a second grader who attends Cerro Gordo Elementary School in Columbus County, N.C.
Watts told the television station that she met with her daughter’s teacher and principal, but the issue had not been resolved as of March 18, 2014. In an official statement, Kent Lovett, the school’s principal, said the student approached the teacher for guidance on the paper early in the writing process. The teacher asked the student if she wanted to stay with that subject, or chose another. “The student expressed her desire to keep Jesus as her hero, and the teacher replied, ‘Okay, that will be fine.’ As the conversation proceeded, the teacher assisted the student in gathering and organizing her ideas so that she could continue, which she did after returning to her seat,” Lovett said. But while the eRumor is true, some versions of it on Facebook include photos that allegedly show an “F” or other red markings on the paper, which are false. 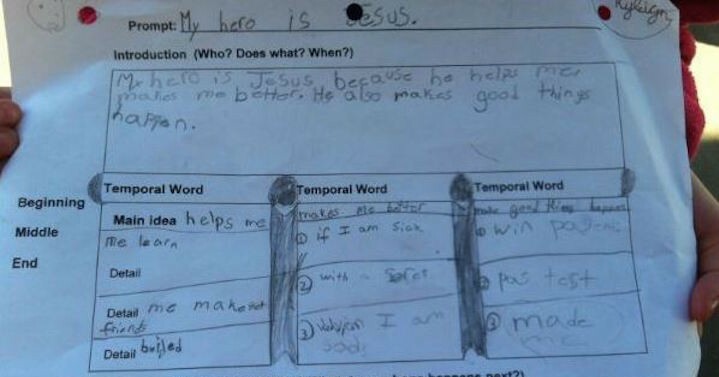 “For the record, I remain in possession of her finished project, which is still entitled, ‘Jesus is my Hero.’ NO red markings, corrections or grades appear on this paper,” Lovett said. Lovett also noted some eRumor photos show a paper written for a high school English class. Military Service of Jeremiah Wright-Truth! Cameron Lyle Ended His Athletic Career to Save the Life of a Young Man with Leukemia-Truth!